Note 2016: This album is NOT up to date. Currently we just email a copy of the map, along with the meeting notice. 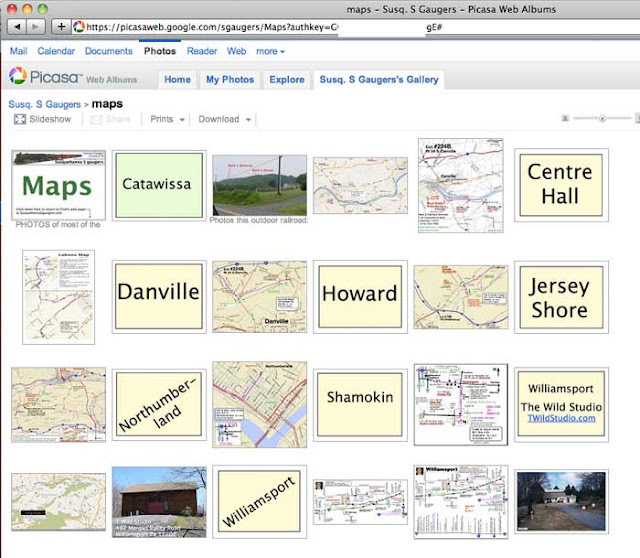 The maps to Susquehanna S Gaugers (SSG) meeting locations are in a PRIVATE Google Picasa photo album. The URL (address) to this album is given ONLY to SSG members. If you are an SSG member, you should already have this link, and you should have it BOOKMARKED for future access. If you have somehow LOST your bookmark, you will need to contact another member to get the address. Note: Some of the maps are also in the OLDER Yahoo files area, but you need to have a Yahoo ID that is a member of the SSG Yahoo group -- and it still can be CONFUSING to navigate, if you're not use to Yahoo's system.